Personalised mini cotton tote bag perfect for storing hobby items, small accessories or as a little book bag. Each bag measures 21x26cm with a 6cm gusset, the bags are made from 100% cotton and have a gusset edge for extra holding capacity compared to flat tote bags. These cute mini bags would be ideal for hobby items such as knitting or sewing accessories, book bag for your favourite paperback, a kids toy bag for car journeys, a nappy bag for babies. The possibilities really are endless and this cute bag is personalised too! These cute mini bags would be ideal for hobby items such as knitting or sewing accessories, book bag for your favourite paperback, a kids toy bag for car journeys, a nappy bag for babies. The possibilities really are endless and this cute bag is personalised too! These bags make a great eco friendly gift bag or party goodies bag, where the bag can be reused after the occasion and machine washed too. Stylish colour and personalised with beautiful embroidered text of your choice in the thread colour of your choice too! Perhaps a name, nickname, His or Hers, Mr or Mrs, large initials or a little messsage. 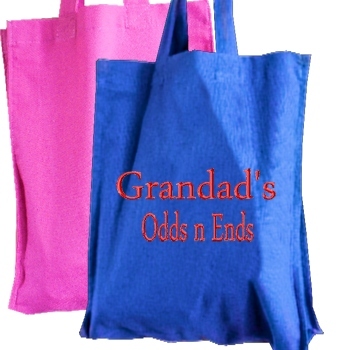 Please allow at least 2-3 days for us to embroider your customised tote bag.